The 10th Mtn All State Marching Band will be organized into three Regiments. 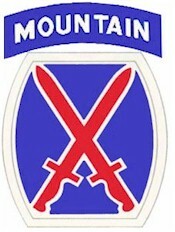 The 85th Mtn Regiment (Brass Section), the 86th Mtn Regiment (Woodwind Section) and the 87th Mtn Regiment (Percussion Section). In this manner, every member of the band will know his or her place in the formation. All communications with band members will be thru e-mail. All appearances will be announced on this web site!